What is the cost of the retreat? The cost of the 49-Day Retreat includes a course fee, an administrative fee, and a fee for food and accommodation at the Ambarina Hotel. If you would like food and accommodation at the Hridaya Yoga Center during the first 10 days of the retreat, this is booked and billed separately. As exact costs for the retreat may vary from year to year, please contact 49days@hridaya-yoga.com for the most up-to-date pricing. What are the payment and refund guidelines? Please note that there is always great interest in the 49-Day Retreat and we want to be sure we can serve the maximum number of participants each year. Therefore, we have a rather strict payment and refund policy for this course. When you are accepted into the retreat, you will be required to confirm your spot by making a non-refundable deposit of $110 USD. The deposit may be paid in cash (directly to our Registration Kiosk) or via PayPal (to info@hridaya-yoga.com). Payment of the remaining course and administrative fees as well as the fee for food and accommodation at Hotel Ambarina must be made no later than 30 days before the retreat. Once paid, these fees are non-refundable. Should you have any questions about the payment and refund guidelines, please email us at 49days@hridaya-yoga.com. How can I best prepare for the retreat? Sahajananda recommends a daily practice of at least 2 hours of Hridaya Meditation. You can find guided meditations and lots of information about this approach on our website. You may also wish to become familiar with the teachings of Ramana Maharshi. We suggest starting with his short book Who Am I?, which is available as a free download. On a more mundane note, we suggest that you be sure to pay all of your bills, create email autoresponders, and deal with any other “real world” issues before the retreat begins. Try to make peace with anyone you have issues with, deal with as many unresolved problems as you can, and tell your dear ones how much you love them. This is very important, as thoughts of unresolved issues may become distracting while you are in solitude. The first 10 days of the retreat will be at the Hridaya Yoga Center in Mazunte. You are responsible for booking your own accommodation and food for this time. If you would like to stay and/or eat at the Center, please email our Registration Team for more information. On the evening of Day 10 of the retreat, we will move to Ambarina Surf Hotel, a lovely hotel on the beach in Agua Blanca, about a 45-minute drive west of the Center. Your fee includes transportation to and from the hotel, 40 nights’ lodging, and food from the morning of Day 11 to the morning of Day 50. How does the retreat end? On the morning of Day 50, Sahajananda will lead a closing meditation at the hotel. There will then be a sharing session for the group to close the retreat. You are invited (and encouraged!) to also share your experience with the entire Hridaya Community at sharing sessions held after the retreat finishes. How will I communicate with Sahajananda? Sahaja will be very connected to the 49-Day Retreat participants throughout the program. Prior to the start of the retreat, there will be an orientation session at which he will give advice and inspiration for the retreat and you can ask questions. During the first 10 days of the retreat, you are welcome to write him questions to be answered during question and answer sessions in the evening. On Day 11, there will be a special Q & A session at the hotel where he can address the special concerns of being in solitude. Once a week in weeks 3-6 you can write him a letter and he will respond a few days later. Retreat participants from previous years report that they felt very supported by Sahaja and his letters were real treasures. 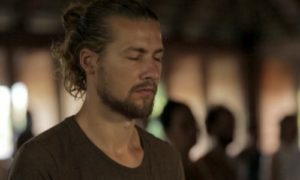 How long should I plan to stay in Mazunte before and after the retreat? We recommend arriving at least one week in advance in order to acclimate to the area and to spend some time joining morning meditations at the Center. There will be an orientation session two days before the retreat, so be sure to be here at least by then. We suggest that you plan to stay at least one week after the retreat in order to enjoy the echoes of the experience and harmoniously reintegrate the outer world into your new expanded consciousness. What are the amenities offered by the hotel? The Ambarina Hotel is a really lovely spot on a quiet strip of beach. Each room is spacious, bright, clean, and has its own ocean view terrace with a hammock. The rooms have a nice bed, a desk, at least one chair, and a ceiling fan. Note that the area does not have electricity, so power comes via a generator that runs for several hours daily. The hotel will provide sheets, bath towels (not to be taken to the beach), and toilet paper. Retreat participants should bring their own toiletries. New sheets and towels will be provided once per week. If you have additional laundry, the hotel provides weekly cleaning service for a nominal fee. During the first 10 days of the retreat, we suggest joining the meal plan at the Hridaya Yoga Center. The Center offers simple vegan meals three times per day during breaks in the retreat program. To sign up, please contact the Registration Office. From the morning of Day 11 to the morning of Day 50, food will be provided at Ambarina. A volunteer from the Hridaya Center and the lovely woman who works at the hotel will prepare the meals and bring them to your door. There will be two meals served per day, one at 11:30am and the other at 6:00pm. They will be simple, vegan, and made with love. I have a special diet. Can you accommodate me? As our resources at Ambarina are limited, we generally do not have the capacity to make accommodations for special kinds of diets. That said, if there are things you don’t eat we will make a note of them and do our best to keep them off your plate. If, for example, you do not eat black beans, when we are serving them to others we will try to give you more salad, rice, etc. to replace them. We cannot, however, make a special meal for you. Please feel free to contact the Retreat Coordinator for more information or if you have specific questions. You will be provided with a 20-liter jug of water in your room. When it is empty, simply leave it outside your door and a new one will be brought to you. We recommend bringing a pump for the water jug (purchased cheaply in nearby Pochutla). How does my room at Ambarina get cleaned? By you! As the retreat is a solitary experience, hotel staff will not enter to clean it. Therefore, cleaning supplies will be left at a central location and you can get them to clean your room as you desire. If you don’t want to leave your room, we suggest bringing disinfecting wipes, a toilet brush, and perhaps a small broom (all available in Pochutla). What is the schedule while we are at the hotel? Of course, you are welcome to do more practice or to modify the schedule based on what works best for you. 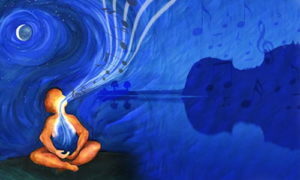 “Practice” is mostly Hridaya Meditation, supplemented by hatha yoga and pranayama. Can I read books during the retreat? The only creative activity that is allowed is writing about your experiences after meditation–and this is highly recommended. Taking notes during the lecture sessions of the first 10 days of the retreat is also recommended, so please bring a notebook and several pens. Can I go outside while I am in solitude? If you are able to maintain a meditative attitude while walking in a public area, you are welcome to go out of the hotel for short periods. When outside, try to stay as internalized as possible, avoiding interaction with others on the beach. If you choose to go swimming, please be very careful, as the current can be strong in Agua Blanca. When leaving and returning to the hotel please be aware that others may be meditating on their terraces. Please avoid gazing up at people so that their privacy and solitude is respected. What if I forget something that I need? Please make every effort to anticipate your needs and bring enough supplies for all 49 days of retreat. If you forget something important, you may write a note to the Retreat Coordinator and s/he will do her/his best to help you. When requesting that they purchase items for you, please be sure to include money with your note. Entering a retreat is not escaping from the world and its challenges, but a longing of our being to dive deeper in silence. During a long retreat, we may experience highs and lows. The first few days or weeks might be the most challenging, as we need to adapt to new conditions and we start facing some limiting patterns and fears. But once the mind relaxes and tastes the first drops of the Heart’s nectar our experience will become more and more simple, light, joyful, and fulfilling. To deepen in Self-Enquiry, we should have the aspiration and determination to follow the guidelines and to do our sadhana (spiritual practice) wholeheartedly. We hope this 49-Day Retreat FAQ has answered all of your questions. If not, feel free to email us at 49days@hridaya-yoga.com. We wish you a beautiful journey of Self-discovery!